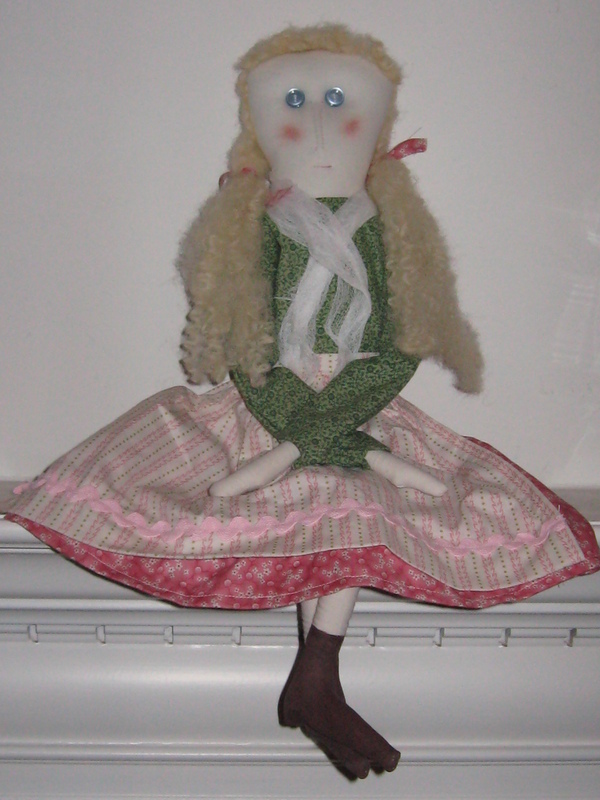 Here is my first attempt at making a primitive doll – Miss Emily. I made her in cottage style fabrics, so she doesn’t really look prim – but I like the general effect. I might end up staining her with a walnut crystals as she looks too clean :). I can’t remember who made the pattern, but it was easy to follow. Dollmaking is a little bit different than I thought it would be (actually easier). For one thing, you don’t cut out the pattern pieces and then sew them together. Instead, you trace the pattern onto the fabric, and then place the fabric right sides together, and sew around the line you traced. This eliminates the problem of the cut pattern pieces sliding around as you are trying to sew around curves. She is a basic cylinder with arms and legs sewed on separately. The arms and legs are filled partially with sand so you can pose her easily (she looks great sitting on top of the fireplace). Her hair is made from doll hair (you can get this at the craft store). I decided to give her bangs since she has such a high forehead, but may end up redoing her hair with thin yard instead. The dress is simple to construct. The shirt is “flat construction”, meaning you cut out the front and back of the shirt and sew it together. The neckline and the sleeves are finished by simply turning the raw edges to the inside. The skirt is a long rectangle that is gathered at the waist. The apron is a rectangle hemmed on 3 sides, with a small waistband. Overall, her outfit turned out really cute! This entry was posted in Dolls and Softies, Sewing. Bookmark the permalink. wonderful job could use a bit of dye for a more prim look. She is really cute. Grandma Dorothy would be very proud of her.